Rob Ford, 1969 - 2016. Photographed in 2010 by Dana Lacey. A controversial and contrary man, former mayor Rob Ford nonetheless got us talking about bikes. With his sweeping dismissals of bike lanes and cycling in general, he made many of us angry and uncomfortable. And in our discomfort we found we had to act, not only to preserve what little infrastructure we had, but to push for a long-term strategy to support cycling throughout the city. Even in his more notable attacks on bicycle planning – comparing riding on the road to swimming with sharks, spearheading the removal of bike lanes on Jarvis Street (at a cost of $300,000 no less) – his concern for residents in suburban areas reminded many of us downtowners of the need for an equitable, city-wide approach to planning and policy. As Dave Meslin (founding publisher of dandyhorse) noted four years ago, Ford voiced support for separated bike lanes (by suggesting we widen, then split sidewalks in half between pedestrians and cyclists). And the year before that, Ford spoke with dandyhorse and clarified some of his earlier missives, calling for greater accommodation of bikes on transit. To put it mildly, we often disagreed with the former mayor. We remember the man with a look back at how we covered his time in office. May he rest in peace. Ford Fest features burgers and …bikes! I spotted a few small groups of kids zipping around through the park, chasing each other or just going somewhere. Parents walking along with their little kids riding their first bikes. Multi-generational families riding together. A fair number of middle-aged adults on bikes. A couple of people whom I recognized as having ridden from outside of Ford Nation (downtown-ish). Even a few spandex-clad "roadies" made an appearance. I have to admit, I was happily surprised. It seems there's actually a fair number of cyclists within Ford Nation itself. Does Rob Ford not understand that his "it's their own fault" comments, and votes against cycling infrastructure actually harm his own supporters? And why do his supporters not flinch when he does this? I have no idea, but I hope all these cyclists at Ford Fest keep on riding, and that cycling catches on with more of their peers. There is no “low cost” plan that will improve traffic times. It doesn’t exist. That’s why this administration is moving so quickly with removal: because the proposal makes no sense and they are trying to minimise both debate and scrutiny. There is no plan to re-install the signals on the middle lane, so we may even see an INCREASE in congestion because without bikelanes we’ll have hundreds of cyclists trying to share the curb lane! The lane is too narrow for cars to pass bikes, so they will all be forced into the passing lane. This will SLOW DOWN traffic, create enormous levels of tension – and someone is going to get hurt badly. 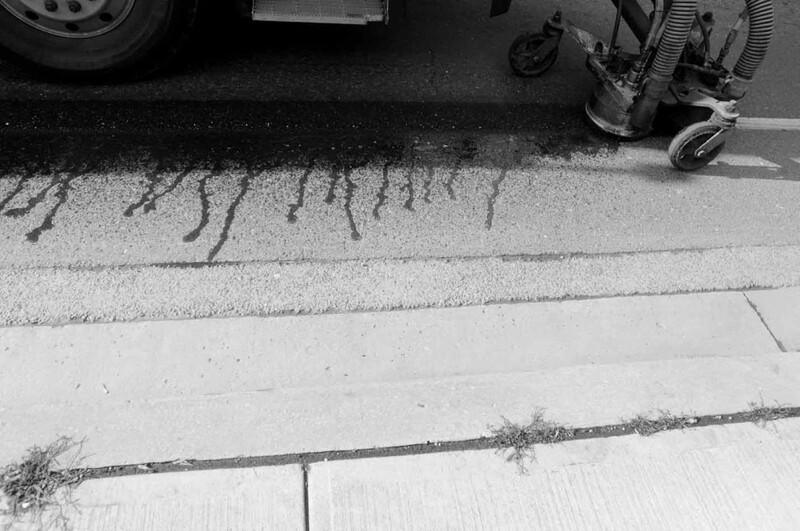 Should the Jarvis bike lanes be reinstalled? The installation of physically separated bike lanes on Sherbourne has long been touted as a solution to the “Jarvis problem,” but they are insufficient, lying three blocks east of Jarvis on the fringe of the downtown corridor. Why should cyclists have to ride three blocks out of their way (and three blocks back for anyone working in the financial district) to feel safe? The only other option is to ride in the shoulder of a five-lane thoroughfare without a painted lane or physical buffer — which drivers don’t relish either. Though the posted speed limit on Jarvis ranges from 40 to 50 km/h, cars frequently travel at a faster clip. A cyclist hugging the curb in the right lane still causes speeding cars to swerve around them or slow to a crawl while they consider the conundrum of a cyclist sharing the same lane. "I’d like to see a mayor that thinks cities are a great place to be. A mayor that supports density and walkability, and a city where getting around by bike trumps getting around by car." dandyhorse: There’s a YouTube video from 2007, now gone viral, that shows you as saying “Roads were built for cars, buses and trucks… my heart bleeds for them when I hear (that a cyclist) gets killed, but it’s their own fault at the end of the day.” This has alienated you from cyclists. Do you still feel this way? Ford: You know, I grew up in Rexdale, where there are no cyclists on the roads—they bike on the sidewalks because it’s less dangerous. Here the roads are multi-lane and are pretty much highways. How can you compete on the road with 18-wheelers doing 60 kilometres an hour? So back in 2007, when someone asked me about bike lanes, I thought it was a non-issue. But now that I’m running for mayor and have started to see what’s happening in other wards downtown, I see that there are a lot of cyclists. dandyhorse: So does that mean you would support bicycle infrastructure? Ford: There are ways that cycling can be included in transportation plans, like allowing bikes on transit like the Go Train during rush hour. It’s ridiculous that there’s no way to bring your bicycle out to my ward in Etobicoke during the busiest hours. 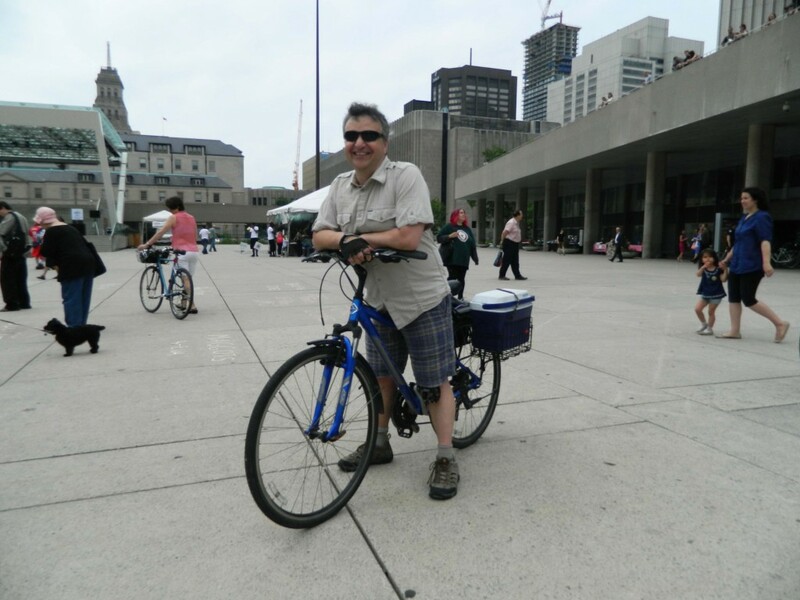 dandyhorse: What about the Toronto Bike Plan? Ford: The problem with bicycles is that they have become a political issue – saying I’ll put in bike lanes gets the support of cyclists, but the rest of the voters will hate me. The debate has become equivalent to abortion – whatever I say, someone will be angry. 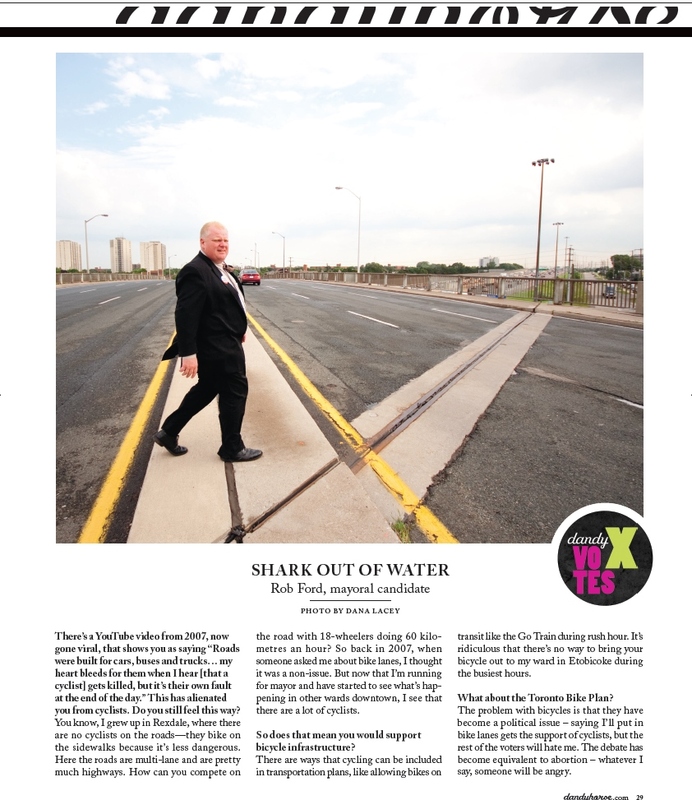 Buy the print issue 5 with Rob Ford in it here. 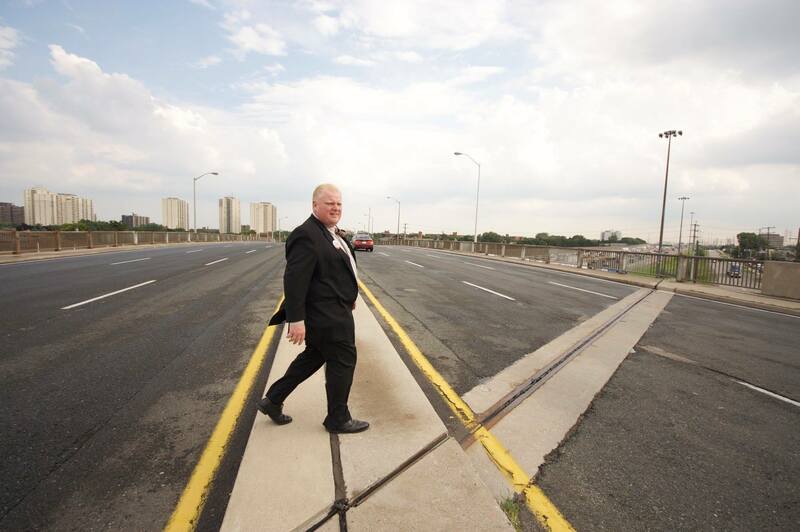 Catching up at city hall: are the Ford follies coming to an end?